Today is October Foodie Pen Pal Reveal Day, and I for one Love Reveal day. So let’s get right to it! This month I received my Foodie Box from Stacey. Stacy is a reader of Healthy Living Blogs and is currently thinking about starting up a blog, and I certainly hope she does. I’m also hoping that she will Guest Post here on 40 Fit in the Mitt. Come on Stacey what are you waiting for? Stacey lives in Western NY and is a Teacher. She loves to cook, bake and shop, and I have to say this Stacey sure does know how to put together one amazing Foodie Pen Pals Box! Thank-you so much Stacey, I am just so excited to try all my goodies. Stacey also sent me a wonderfully written card and her secret recipe for Artichoke Dip with a special ingredients twist.. I am sure looking forward to trying this recipe out. So now to the box. It was boxed up so nice in tissue paper and was so much fun to unwrap. So I grabbed all my goodies and took them outside for a little photo shoot. Check out my loot. So the first item was this super cool Vanilla Infusion Kit. I am so excited to break this open and Make My Own. I had no idea something like this was even available. All you do to make your own is split the vanilla bean and fill with vodka. Then you store for 4 to 6 months, and BOOM you have your very own 7 year supply of Vanilla. I just cannot express how EXCITED I am to make my own. Crouching Tiger Mix. Love a crunchy snack mix. These lovely little cookies, I dug right into these, and each bite of these cutie patootie cookies had a nice peppermint mocha flavor. Sweet Potato Chips, Yummy. They had a nice flavor, super crunchy. I loved all the items Stacey picked out, and just love the Foodie Pen Pal Program, I so look forward to it so much each month. This month I was paired up with Renee. Renee is also a Healthy Living Blog reader and lives in Illinois. I’m also hoping Renee will Guest Post here as well. Renee loves to cook and bake. I think the one thing I love so much about the Foodie Pen Pal Program is how much fun it is to see where your Foodie Box is going and where yours is coming from. You sure do meet some amazing people all over the USA. Hey Fellow Foodie Pen Pals, let’s help Lindsay spread the word on the Foodie Pen Pal Program and all Tweet about our Boxes! Don’t forget to use the hashtag #foodiepenpals. Today is the Day! 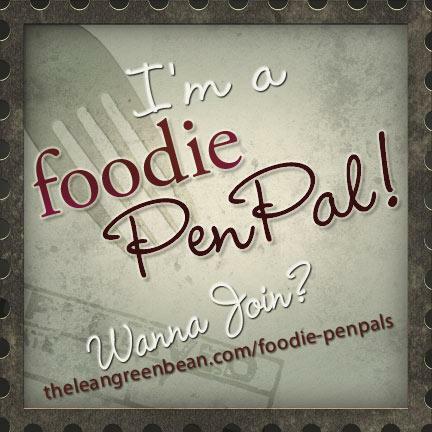 It’s September Foodie Pen Pal Reveal Day. Let’s meet Alek, he is a great young blogger who I meet some time ago via his blog. Alek and I commented back and forth on blog topics and then we lost track of each other. So when I received the email from him that he was going to be my Foodie Pen Pal, I was Super Excited! I immediately caught back up with his blog and was super impressed with how well he has been doing. Alek writes the blog RunServeCook. He has great recipes and loves to eat healthy foods. He runs track and I just love following his blog. So back to his recipes and cooking talents. Alek has one recipe that I was Super Impressed with: Indian Seared Scallops over Rissoto and Wilted Spinach and Curried Spinach Puree. Did I mention that Alek is still in High School! Here’s a shot of the Nutritional bars he sent. Loving the variety. Then I received a bag of Wonderful Pistachios and a Dove Silk White Chocolate and Milk Chocolate Swirl Bar. Then there’s this little snack. Pure and Simple Bumble Bar, Organic Seed Cherry Chunk bar. I am saving this for a trip I have planned in October. I always hoard snacks and healthy treat for when I travel and this one looks like a tasty treat. I had the same intentions for these Justin Nut Butters, but my will got the best of me and I ended up using them in my Overnight Oats. Let me say this, I love Justin’s. So smooth and love the Honey flavor. Alek sent me a few cool packets and I look forward to trying the GU after a swim class I have planned. I am familiar with the Emergen-C packets, but have never tried the Joint Health. I love trying new products. I am really excited to try the Mila seeds. I am a huge fan of Chia seeds and I love to try other varieties of this Super Food. I plan on making a huge berry and kale smoothie and incorporating the Mila. Doesn’t that sound yummy? I’ll let you know. So I really have to thank my Foodie Pen Pal Alek for Hitting it Out the Park with this Foodie Box! Alek you did a great job putting together an amazing box of variety and delicious foods for me to try, thank-you so very much my Foodie Friend. This month I sent a September Foodie Box to Colleen over at Secrets from the Cookie Princess. Go on over and visit her blog, she has some amazing cookie recipes. She is a serious baker and has so many recipes available. I am working on my baking skills so her blog has all the recipes I could ever need. I plan on making her Chocolate Peanut Butter Yin Yangs cookies for Christmas. They are a thing of beauty. Hey, I had a question recently asking why I use the sign off Check Ya Later. Well here’s the reason. Back in the day there was a movie call Dazed and Confused and there was a scenes from the movie with a charter named Slater who used the phrase Check Ya Later, and the other characters teased him for it. Well me and my brother use to say it to each other ALL the time and it just sort of stuck as our way to say good-bye! I love to quote movie line, it’s how I roll.